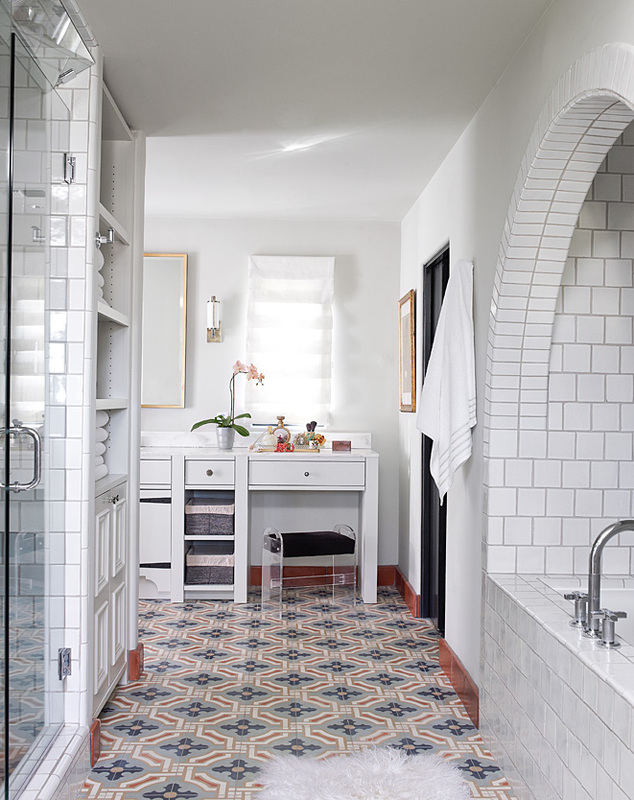 Mix and Chic: Stunning white bathrooms! There is nothing more classic in decor than an all white bathroom. An all white bathroom simply exudes beauty and timeless elegance. It's appealing to many people because of its versatility. Using a white bathroom as a backdrop and jazzing it up with gorgeous colorful tiles, a marvelous artwork or pretty accessories and instantly, you have a classically chic bathroom. Incorporating crisp, clean lines and sleek bathroom furniture and accessories throughout and you have a modern bathroom. No wonder it is such a popular choice among designers and the rest of us! Which white bathroom inspires you today? That first bathroom WOW love that floor. Gorgeous and unique. oh! I just love the bathtub in the 4th picture!!! I have a hard time selecting my favourite. The second pic is my favorite because it really draws attention to that amazing colored tiled floor. I love the first and second pictures. My favourite white bathrooms have white gloss tiles and then a gorgeous painted wall above! the top bathroom looks just perfect to me...love it! Oh I love the spaciousness and airiness of the last one. the first photo is my favorite. i love all white everything! I love the first pic, those tiles are divine against a white bathroom. These are all INCREDIBLE! I'd love to have a mirror in my bathroom where I could sit and have all my make up on display. 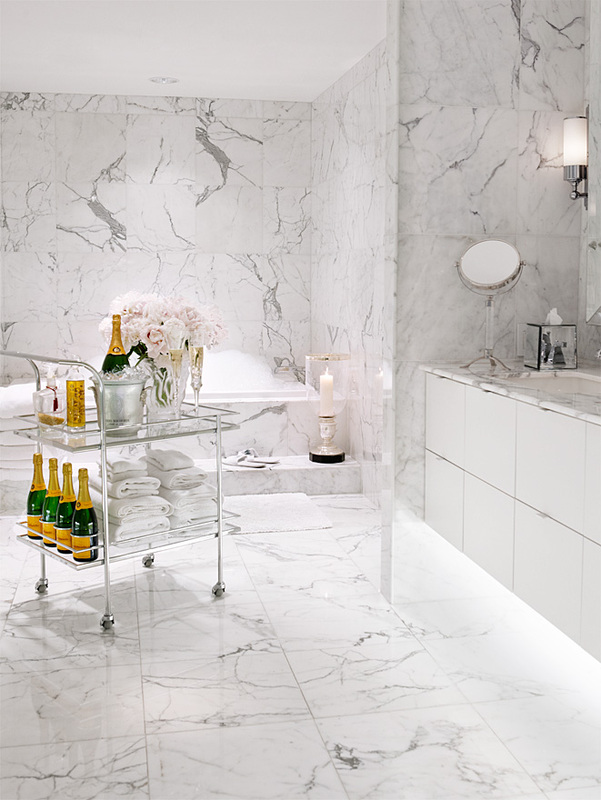 A cart of champagne is certainly what I need in my bathroom. Hi Jesse, I'm mad about the first image, of course because it has a pop of yellow! But I also think the flooring on that one is great. You always find the best images! THESE ALL INSPIRE ME! My goodness they are beautiful! Love bathrooms, it's where we can relax at the end of the day. My favorite is picture number 4. That last one totally had me swooning! I don't think I would ever leave my bathroom! LOL! 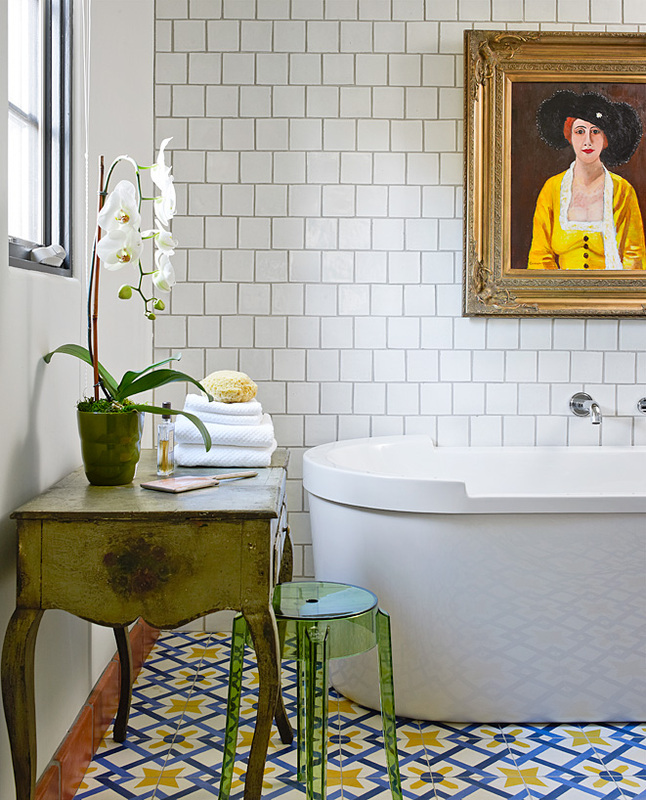 Love the picture in the first bathroom - the yellow just makes the whole room pop - lovely. SO pretty! The floors in that first pic are stunning! They are all beautiful! I particularity like the spaciousness of the last bathroom - and the outside view ... Great post Jessie! I do adore white bathroom. I would like to have a white bathroom with white floor tiles, white marble and using flowers or candles to add a pop of color. Love the floor is the first one and the distressed green vanity with the modern lucite green stool...love that! These are amazing! I love white interiors and even more so in bathrooms! I just LOVE an all white bathroom-I made mine all white too :) That 4th picture is my absolute fave! I love them all! White bathrooms have always been a favorite of mine (along with wooden walled bathrooms! )They look so crisp and clean!